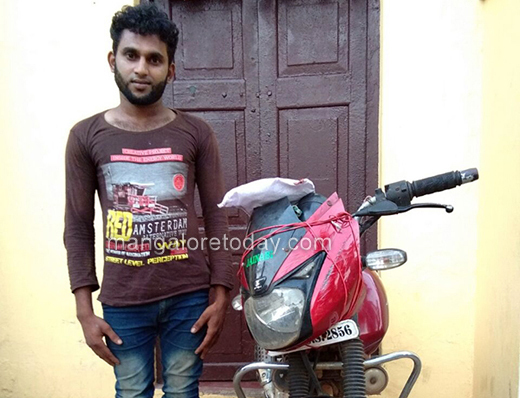 Mangaluru, Oct 21, 2017 : A drug peddler arrested in Neermaraga by City Crime Branch(CCB) slueths in connection with selling ganja to youths on October 21, Saturday. The arrested is identified as Mohammed Riyaz(24) of Neermarga. Under the directions of Police Commissioner T R Suresh, DCP Law and Order Hanumantharaya, DCP Crime and Traffic Uma Prashanth,CCB Inspector Sunil Naik team conducted the raid opeartion. They had information about drug peddling in the region. Mohammed Riyaz was cuaght red handed while selling ganja packets to the students of Karavali Institute of Technology at Olabail in Neermarga. He was taken to custody and have seized 250 grams of ganja, Pulsar bike and a mobile phone, a total worth of Rs 36,000 from accused.